Print area 31"x79" Full Color Glossy Finish / Stands are attractive way to bring attention to your message. If you are looking for a mobile message, POP, x banner, display banner, sidewalk signs, plasticade signs are ideal for it. 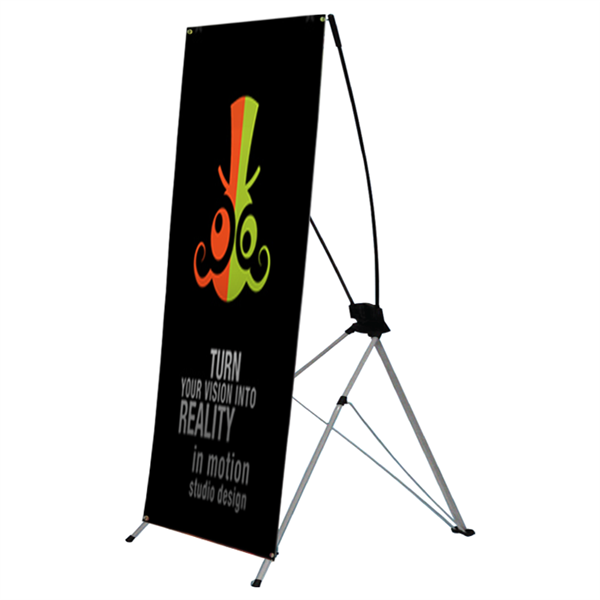 Retractable Banner Stand. Do you need a banner that is easy to display, looks professional and is easy to transport from place to place? Then look no further! Retractable banners are a two-in-one product. This means that the banner and stand come together and no additional accessories are needed for installation. You no longer have to worry about purchasing the right mounting accessories later, they're already included! The stand itself is sturdy when set up but also breaks down, rolling up into a slender base when not in use. You no longer have to worry about lugging giant banner stands with you everywhere you go! To set up a retractable banner, simply pull the banner up out of the base and secure the stand. It's as easy as pulling down a window shade! 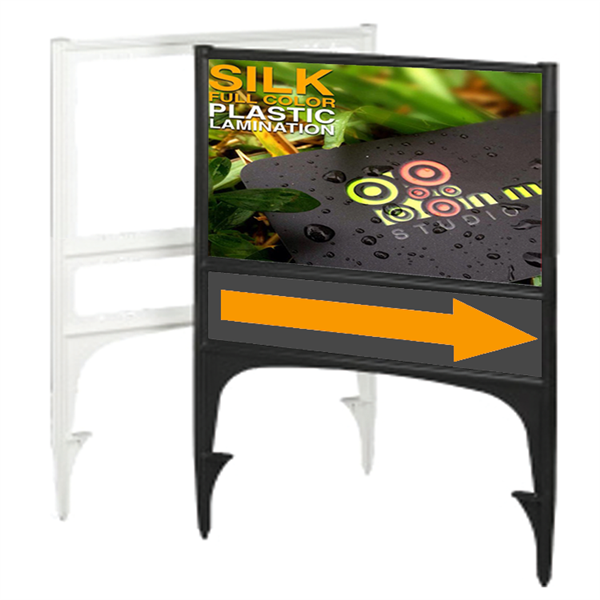 There are important things to consider when purchasing a Pop-Up Display Sign for Trade shows and Exhibits. Besides their professional look, they are lightweight and simple to assemble and/or transport. They are also easy to display. If you are looking for a mobile and attractive way to bring attention to your message, POP (Point of Purchase) or stand up displays are the answers. Roll-up banner kits are the most commonly used. They are setup quickly and are easily to transport, providing a low-maintenance advertising solution. 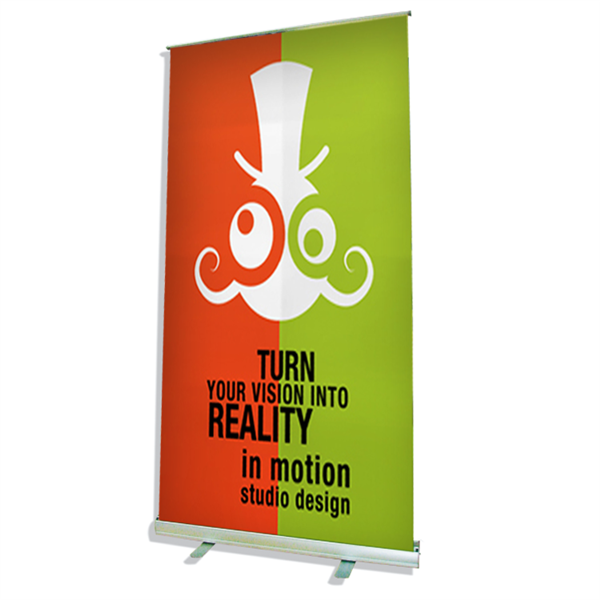 In Motion Studio Design can create complete banner display kits that are perfect for any special event. 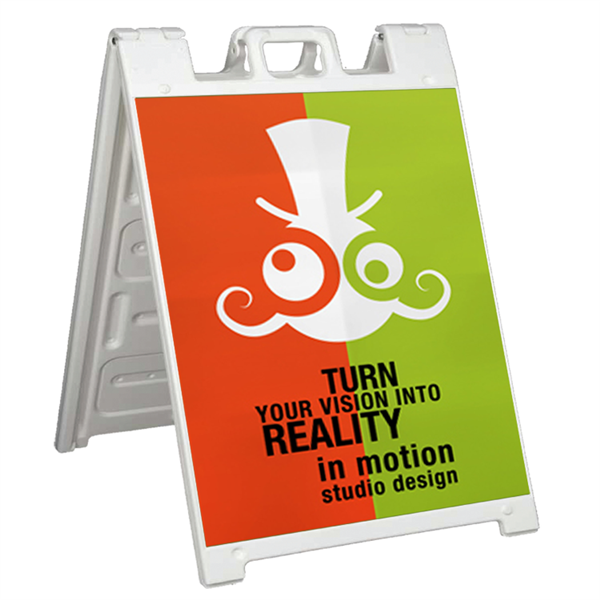 We have a large selection of stands, from simple lightweight flex frame to a heavy duty plastic sidewalk sign displays. •Banner and stand come together for one low price. •Comes with a free carrying case for easy transport. •Easy for one person to set up. •Stands freely on the floor or table no hardware needed! •Professional looking Plus, retractable banners are completely customizable. •You can use any and as many colors you want. •X-Banners are commons at trade shows. What colors and materials are retractable available? Our Economy Stand comes silver. But the banner itself can be designed by our professional design team in any and as many colors as you want! What are common uses for retractable banners signs? Retractable banners are common at trade shows in malls or lobbies and at retail shops, spas and high-end retail shops.